Well, we've got week two under our belts ... and boy oh boy, it was a long one!!! Even if it felt long, we still learned a lot and had a lot of fun while learning - always my goal! On to Place Value. We've been doing a lot of operation review during the first two weeks. As part of our daily calendar/number of the day review at the beginning of each class, we've also been examining number forms (standard, expanded, written) and factors and multiples (I'll do a blog post about this in the near future). With students already familiar with some of these concepts from our daily review, when we started officially learning about place value on Thursday, the transition was an easy one. This was the first journal entry we completed with left-side and right-side of the page thinking, so we took it nice and slow. I modeled each step for the students, and took them through each section of the left-side of the page together (where they show their own thinking). I will probably do this for one more journal entry, and then gradually release the responsibility to them. After we recorded the learning goal (curriculum language on the right side, and in our own words on the left side), and completed "what I know", we started. 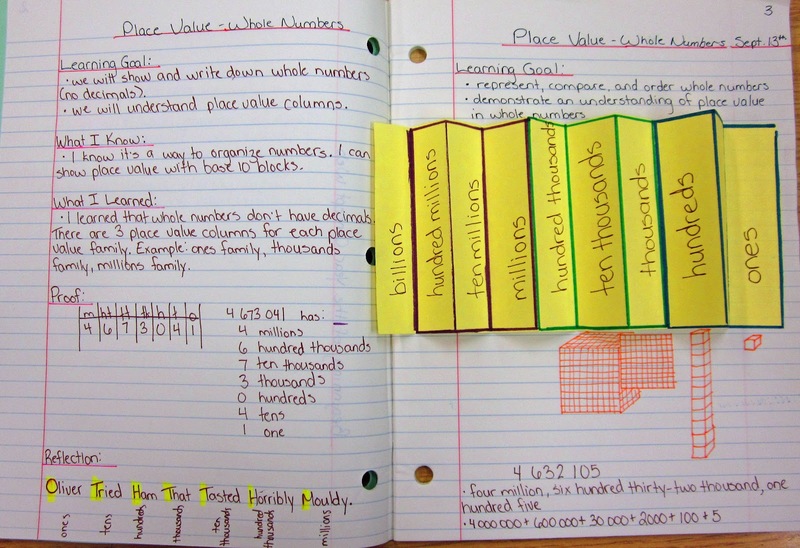 We made an accordion fold interactive tool for place value this year (I want to do a different interactive tool from last year for each concept we include in our journals, as I have half of my students from last year and want to keep things different for them). 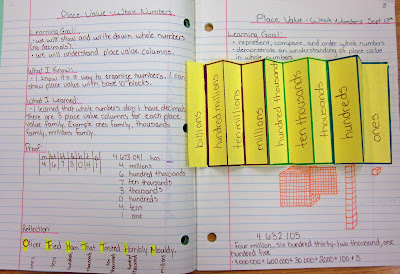 Last year we made pockets and number strips for place value - up to the hundred thousands. You can read about that entry HERE. A few of you wrote to tell me that your students are responsible for numbers up to the billions. 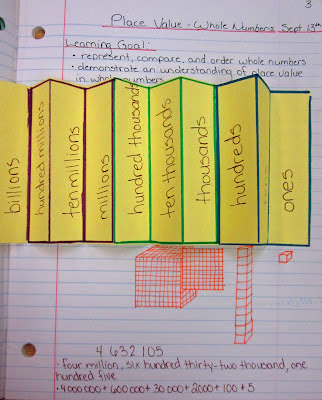 Where I live, my students need to read numbers up to the millions, but are only responsible for knowing place value up the hundred thousands (grade 6) and ten thousands (grade 5). So, I decided to make our interactive tool include place value up to the billions for you. I gave each student 1/2 a sheet of paper (lengthwise), and asked them to make accordion folds for 10 sections - I modeled this process to the class. 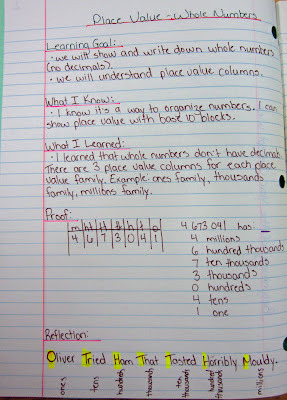 After we had labeled our columns, and glued the tool into our notebooks (glue only the ones column), we drew in base 10 blocks below, and practiced the written and expanded forms of a number chosen by the class. As my grade six students could work independently on the right side of the page, one of them asked to share what she had come up with. She displayed it under the ELMO and showed the students what she had (which was fabulous because she made a picture/diagram, so the students had the opportunity to see two different forms of reflections). That's about it ... did you happen to see the TeacherspayTeachers newsletter this morning? 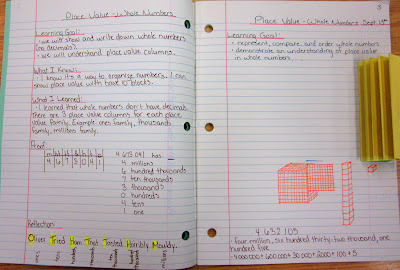 My Interactive Math Journal was the #1 product of the week!!! YAY!!! Thank-you so much for all your support. I have received so many wonderful comments from all of you - and am so excited about each one. This is something I truly believe in. For the first time ever, my students were actually excited about math journals, and their math scores (from our provincial testing) showed that they are comprehending the concepts much better! If you are using interactive math journals in your classroom this year, I would love to hear how they are working in your classroom. 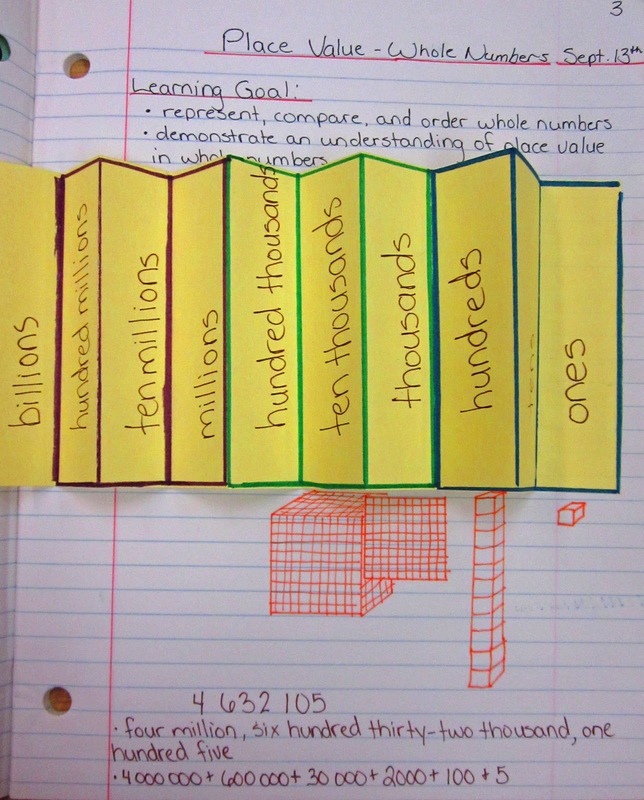 I am going to be starting interactive math journals tomorrow and am really excited about it!!! I also teach a 5/6th room and love reading your ideas in your blog! Thanks! Andrea - I've sent you two emails - one yesterday and one today - and forwarded you the link to download the product. Have you gotten either of them? Perhaps your hotmail address is blocking the emails - do you have a different email address I could send it to? If you haven't received my emails, or the email from my store, it could be a problem with your hotmail. Perhaps the emails have been sent to your spam folder. Please respond here and let me know if you've gotten any of the emails. Thanks so much for getting back to me. I havent received the emails. I did not see them in my junk folder (although I do frequently delete my junk folder without looking at it) Could you please email me the PDF to my work email: andrea.alves@yrdsb.edu.on.ca Thank you so much!! I love that you are one step ahead of me!! Thanks for tomorrow's lesson! 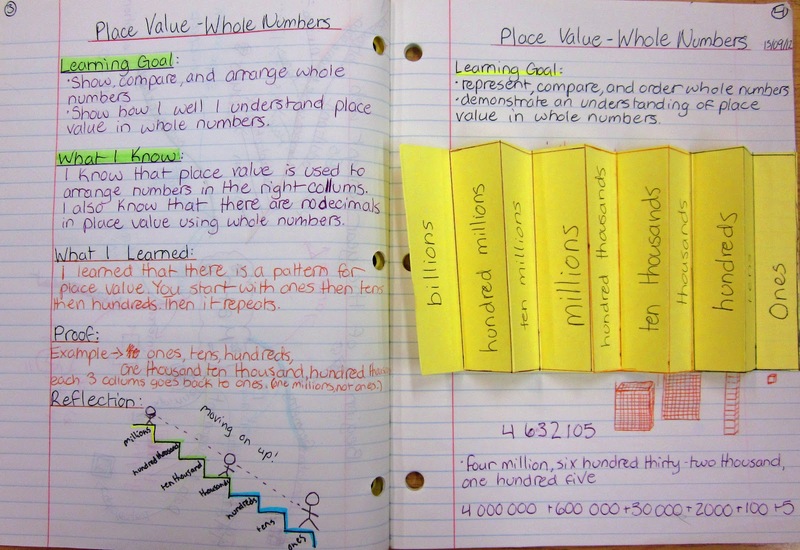 I absolutely LOVE your interactive math journal ideas - I modify many of them into ELA as well. 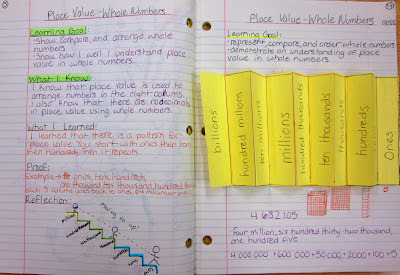 Your students pages are so colorful/neat/organized. Question: HOW do you get them to be so GOOD LOOKING?? Also do you give the students time to "Color" during class time or is that an optional thing? Lastly, how much time do you give them to get the notebook done during your lesson? What if a child does not get it all done or you have a SUPER slow group? Thanks for your grateful <a href="http://blogs.studentsarea.com”> student blog </a> informations. Your student's journal look fantastic! How do you set up your calendar time/daily operations practice for your students? 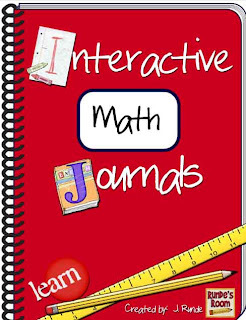 I have been looking at your Math Sunday Journals for awhile now and jumped at the chance to buy your Interactive Math Journal pack. I've already started using it and the kids love it and are already referring back to their notes if they don't remember something! Friday, we ran out of time to do an interactive journal entry and the kids were really disappointed! I love the way this has changed my math instruction. Thanks for sharing with us and congrats on your #1 spot! I'm teaching a brand new intervention class that was formed this year at our school and we are working in our JAMs (they love this name!!). The parents were excited to see this notebook during Open House too. Thank you so much for all you are doing!! Hi there! 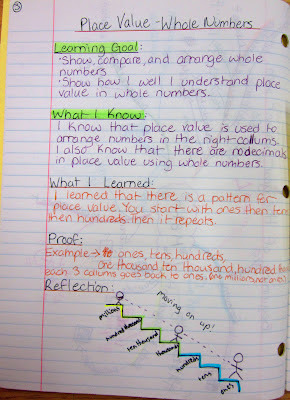 I'm attempting to follow your format for interactive math notebooks this year.. And while I'm so excited for it, I'm wondering about a few things.. I'm finding my kids take like 20 minutes to copy the Learning Goal, rewrite it on the left side, and then write the What I Know section! With only an hour of math a day, this is much too long.. And I don't want to have them still writing when I move on to the input part of the lesson or they'll miss out on the important stuff.. How do you deal with this? Also, my board is really into the problem-solving 3-part lesson.. How do you meld the notebooks and problem-solving together? I have ordered your interactive Math journal at the end of August, but have not yet received it as of today! I am chomping at the bit to get started on our notebooks! Hi! If you ordered from TeachersPayTeachers, just check your "my purchases" page - the link to download it is there. If you ordered it from my store on my blog, you should have received an email receipt with the link to download the product right after your purchase. Please let me know which way you ordered it, so I can make sure you are able to download the product. Thank you for the inspiration my kiddos are digging their math spirals. Ive always done interactive notes, anchor charts and cheat sheets with students...but now they have a home! I bought the interactive journal from TPT, and it this template wasn't included. If there is anyway I could get the PDF for this entry? I would love to hear more about daily calendar/number of the day review that you do at the beginning of each math class. Do you have anything in the TPT store regarding this? I have been looking for something like this. Thanks so much for sharing your blog. It's great to find another Canadian teacher teaching in intermediate!! I teach Grade 5/6 in BC. Love all your stuff!! Hy.... I want to share this amazing post with my friends and others and i know that they will definitely like this post. I am feeling much happy to find this post. Thanks for the sharing with us. Check college paper for best papers. 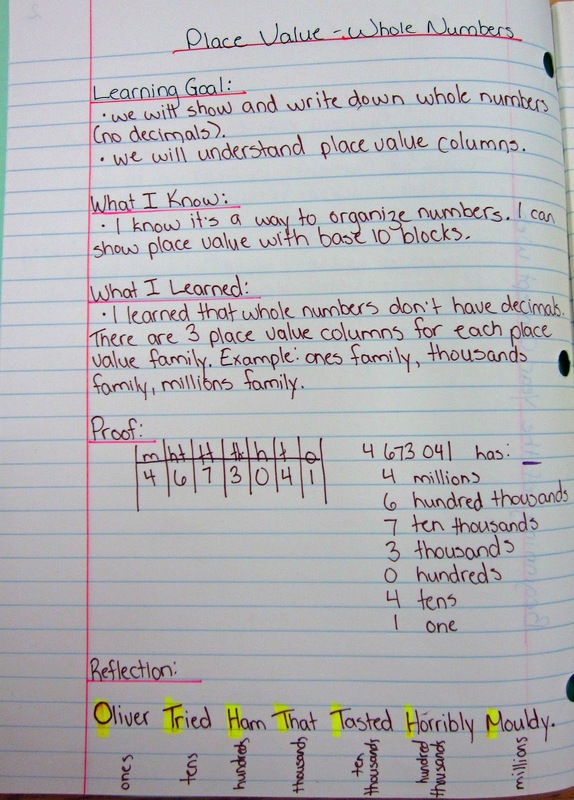 Thank you so much for sharing the Interactive Math Journal. 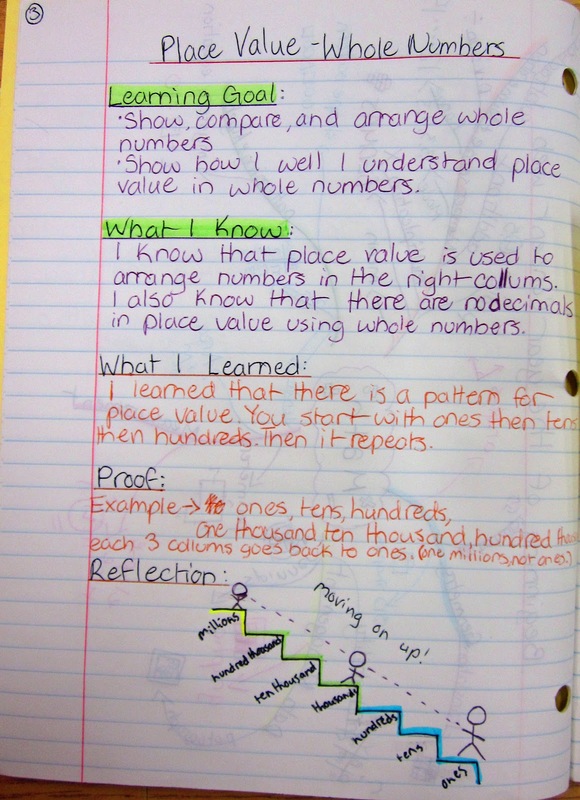 I use a math notebook for student work, but I really like this reflective piece and the "what I know" and "what I learned" piece. I am not sure it works like this. You cannot just pay someone to have your homework written for you! This is not hoe people have built great companies and have had their names featured on Crunchbase.